A man has fallen from a multi-storey car park in Sussex. 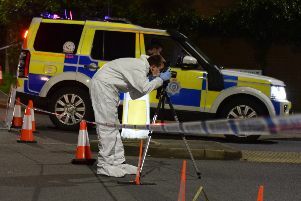 Acccording to an eyewitness, the man fell at the entrance of the High Street multi-storey car park in High Street, Worthing, next to the Guildbourne Centre. Police were called to the scene at 2.08pm. At 2.30pm, at least three police cars were at the scene, along with at least three ambulances. Police could be seen on the fourth floor of the car park. The man was treated by paramedics and put onto a stretcher, and transported to Steyne Gardens, where the air ambulance landed to transport him to hospital. Steyne Gardens was evacuated, and several roads were closed by police. The Steyne was shut, as well as part of Brighton Road, from the traffic lights next to Steyne Gardens up to High Street. Customers of the ice rink in Steyne Gardens could still be seen inside. By 3pm, the roads had been reopened. The man was treated by paramedics next to the air ambulance in Steyne Gardens before being flown to hospital at around 3.20pm. To contact Samaritans call 116 123 for free, 24 hours a day, 365 days a year.